Pre-Ballet: An introduction to movement coordination, rhythm, and music. It is our aim to preserve and properly direct this artistry in a child. 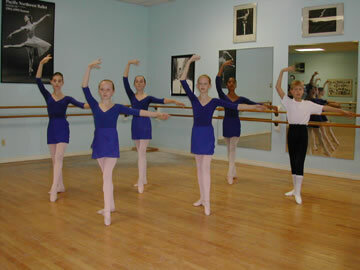 The results of this course make it easier for a child to begin the formal training that is required in academic ballet technique. Pre-Ballet is available to children from the age of five to six years. Academic Ballet: Technical training that is the basis of all ballet movement. Classes are carefully graded, and the best elements of the Russian, Italian, and French schools are used to insure a well-rounded dancer. Pointe Work: Classes that are devoted exclusively to the technique of performing ballet movement on pointe for maximum theatrical effect. It is designed for those students who have achieved technical and physical readiness. Variations: The study of solos and corps-de-ballet from classical ballets, as well as contemporary works. Modern: Often called "barefoot" dance or "freedom", modern is a distinct method of training emphasizing rhythm, design, shape, and motion in space. The percussive technique of Martha Graham, as well as the more lyrical technique of the Humphrey/Limon School is taught. Men's Class: Ballet class for males only, developing strength and technique necessary for the bravura style of the male dancer. Body Conditioning: Designed for intermediate and advanced dancers as well as adults with prior dance training, this class consists of stretching and Pilates-based exercises to increase the flexibility and strength. Beginner I, II, III & IV One hour of class or more per week. Beginner V Two 1-1/2 hour class or more per week. Intermediate I & II Two 1-1/2 hour classes or more per week. Intermediate III, IV, V & VI Three 1-1/2 hour classes or more per week. Advanced I-II Four 1-1/2 hour classes per week. Ballet and pointe work perfected. Performance experience developed. Variations Available to advanced students. Character Open to Beginner IV through Advanced students. Modern Open to Beginner IV through Adults (ballet training recommended).